If you find a home that interests you, call Jim at 512.913.1557. Neighborhood Location: Take IH-35 South from Austin to Exit #220. Turn left over IH-35 onto Overpass Rd., then right at FM-2001. Stay to the right (go straight) when the road curves left. Take a left at Stone Crest Blvd. to get to the new section. Take a right at Stone Crest Blvd. to get to the original section of StoneRidge. 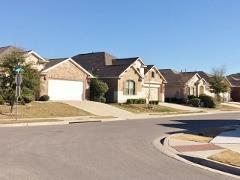 Discover StoneRidge Buda, its schools, parks, nearby shopping, churches, etc. Interactive Google map link. The first MLS-recorded home sale StoneRidge occurred on 8/31/2004. From the table below, you can get get an overview of how things have changed in the StoneRidge Buda real estate market. StoneRidge real estate market data from the Austin Board of Realtors, 1/1/2011-12/31/2018. 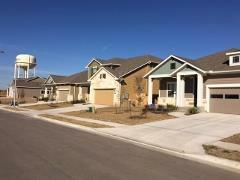 This c ommunity was initially developed and built by David Weekley Homes during the years 2004 to 2009. The first home sale in StoneRidge was completed in the latter half of 2004. The builder began expanding the StoneRidge neighborhood in 2015. That work is continuing into 2018 with a new model home and a new section recently opened. A number of new homes are in progress in 2/18. Note: My wife and I now live in the StoneRidge neighborhood. I would love the opportunity to assist you in finding your place here. Call or text me at 512.913.1557. David Weekley's Imagination Collection has 7 single-story plans and two 2-story plans. Base prices of these homes start at $229,990 and go up to $276,990. Homes in this series range in size from 1,432 to 2,992 sq. ft. These homes are built to be energy efficient. They provide StoneRidge homebuyers with a number of upgrade options to match their tastes and to stay within their budgets. Resale homes in StoneRidge range from just under 1,400 sq. ft. to 3,360 sq. ft. These homes offer buyers a choice of 1 or 2 stories, 3 or 4 bedrooms, and 2 to 3.5 bathrooms. It is likely that some have been upgraded since they were built. 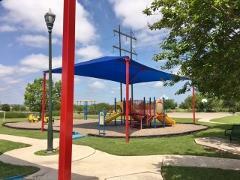 Homeowners and residents of StoneRidge have access to a 5-acre City of Buda neighborhood park that features a very nice play area for children, teens and adults. It is located at the corner of Glenview Ln. and Stone Rim Loop. Owners of homes in StoneRidge are required to maintain membership in the StoneRidge HOA. Fees of around $250 annually (January 2018) are collected for keeping up the park and other common areas of the neighborhood. The Stoneridge neighborhood is located within the Buda city limits, and has lower taxes than some close-by neighborhoods that have municipal utility districts (MUD). StoneRidge is well-situated for access to the major traffic arteries that serve the Austin-San Antonio area! Many shopping and medical care facilities have "sprung up" over the past several years in Buda and Kyle. 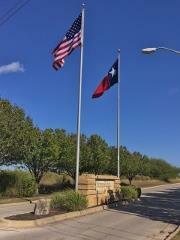 Buda is home to the very popular Cabela's outdoor sporting goods store, a Super Walmart, and a HEB grocery store. Kyle features four retail developments: The Village at Kyle (Lowe's, WalMart), Kyle Marketplace (HEB Plus), Kyle Crossing (Ross, Target), and Kyle Town Centre (Home Depot, EVO). Seton Medical Center Hays (hospital) is located in The Village of Kyle development. Residents also have easy access to area employment, and to many retail outlets and other facilities along the Austin and San Antonio corridor. These include Southpark Meadows at W. Slaughter Lane in South Austin, and the two outlet centers on the south side of San Marcos (Premium Outlets, Tanger Outlet). The closest golf course is Kyle's Plum Creek Golf Club, a challenging 18-hole layout on the north side of the Plum Creek development. The City of Buda also provides a number of public-park options for family outings. Students living in StoneRidge attend schools of the Hays Consolidated Independent School District. Since school attendance zones are sometimes redrawn, potential buyers should always verify the current school assignments with Hays CISD.